Most places you travel to, you have a fairly good idea of what to take. Beach holiday? Bikinis and flip flops. City break? Trainers and skinny jeans. Skiing – well, you get the idea. 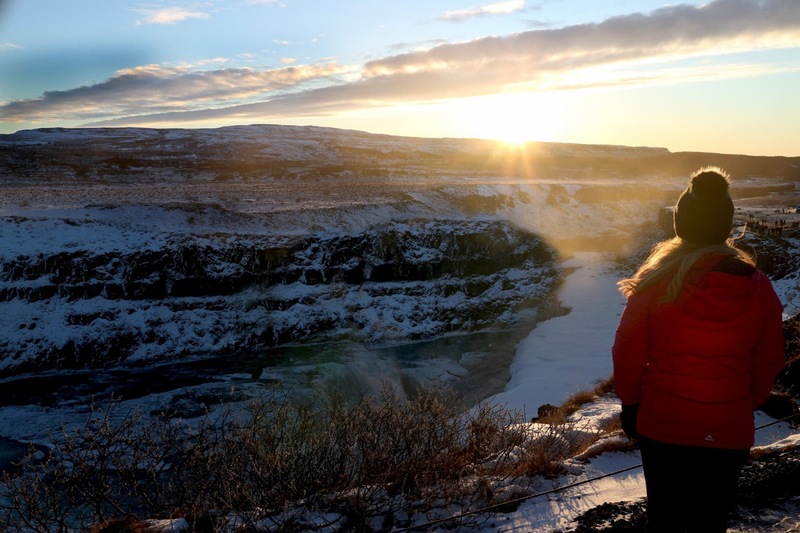 But Iceland, and especially Iceland in winter seems to be one of those places that is sort of a packing enigma – the temperatures aren’t as arctic as skiing but you definitely need more than you would for your average winter getaway. And then there’s all the tours you go on. Do you need to prep yourself for a Bear Grylls arctic explorer type situation or would your converse and ear muffs be enough? 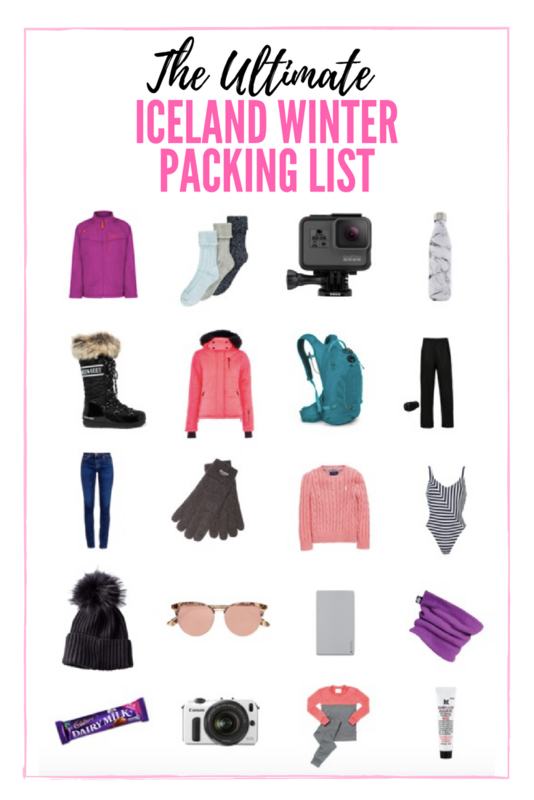 After heading to Reykjavik over New Year’s I’ve put together my ultimate list of what to pack for Iceland in the winter. Just a disclaimer, I haven’t included things like a toothbrush and pants as I’m guessing you guys can handle that part! I’d say the single most important thing you need to get for your trip is snow boots and I’d really advise getting boots that have inbuilt crampons like these Calzats, as much of the ground on the tours – and even around Reykjavik – can be slippy. If your boots don’t have them built in you can get add on crampons like these, which you can just pop on as and when you need to. Another essential is a warm, waterproof coat – if you have one already a ski jacket would be perfect and if you’re looking for the perfect Insta shot a bright coloured coat like this looks best against the white snow. Pack enough for two pairs per day. I just got a cheap pack of three from trespass but if you fancy a splurge these heat holder ones have great reviews. You may be tempted to pack the biggest fluffiest scarf you can find, but in my opinion they tend to get a bit in the way. Instead go for a fleecy neck warmer which keeps your neck and mouth super toasty without bulking you out too much. The key to keeping warm in Iceland’s sub zero temperatures is layering and this means getting hold of a number of thermal under-layers. Each day I tended to wear a thermal vest, one thermal long sleeved top and two pairs of thermal leggings as my base layer and this kept me pretty snug. M&S have a really wide great value range for both men and women and even have some patterned designs which were great for wearing when we went out on the evenings. You won’t necessarily need these but it’s best to keep a pack in your rucksack to be on the safe side. A fold away pair like these Trespass ones are ideal. The last thing I popped on underneath my ski coat was a thin thermal fleece like this Regatta one. A fleece not only gives you an extra layer to protect you when you’re outside but also means you can take your coat off on the coach journeys without feeling chilly. Evenings we tended to go for dinner in one of Reykjavik’s many restaurants. Instead of wearing all your basic thermal layers it’s nice to have some smarter thick jumpers you can pop on top of just a couple of them. That way you can stay warm but feel a little more dressy. I also packed a couple of pairs of jeans for evening – meaning I could keep my thermal leggings for the day time. Pretty self explanatory – go for a thick one! The thing that got the coldest during my trip was definitely my hands and I learnt that just like the rest of your body – layering is the trick. Team a thin wool pair with these waterproof thermal ones from Trespass and that should keep you cosy. They are also touch screen compatible so you can use your camera and smart phones without taking your gloves off (because trust me they will FREEZE when you do). Most of the tours you go on will mean you’re out all day so you’ll need a rucksack to keep all your essentials in. A waterproof one like this Osprey bag has lots of sections and feels really lightweight on your back. For social snaps your smartphone camera will get the job done. But a place as beautiful as Iceland looks extra special if you can invest in something a little more hi tech. I took advantage of the January sales and got the Canon EOS M10, which is a really great little compact system camera for your travels which has inbuilt wifi and a selfie friendly flip screen (look out for a more detailed post on why I love mine soon)! As well as being cold, Iceland can get pretty windy which means the parts of your body that aren’t covered up can get a bit blown about. Keep a moisturising lip salve in your pocket to make sure your pout is protected. In the winter months, you’re likely to be greeted with a snow covered Iceland that has a blanket of the white stuff pretty much everywhere. It looks super magical but it also means that there can be some serious glare. Pop in a pair of sunglasses and get polarised ones if you can as they are better at keeping glare at bay. One thing I didn’t anticipate was the effect the temperature has on batteries. On many of the trips our phones and cameras would completely die outside because they were too cold. Once we were back on the coach they would switch back on but it’s worth having a powerbank with you to keep you charged on the go. Another handy tip to save a few pennies is to always carry a water bottle with you. Iceland has some of the safest, cleanest tap water in the world as it’s sourced directly from their springs. Ditch the bottled water and just fill up your own wherever you go. A final pretty obvious must if you’re paying a visit to the blue lagoon! So, hopefully you found this useful! Have you ever been to Iceland in the winter? What would your list of essentials be? If you’re heading to Iceland soon I’ve also created a handy pinable visual list for you below. Enjoy!